The simplified but efficient design of the items makes it possible to assess the individual long-term attention without disadvantaging respondents with a weaker performance. Assessment of the long-term selective attention and concentration ability, general performance and commitment; applicable for people 15 years of age and over. Main areas of application: clinical psychology, occupational and organization psychology, medicine and pharmacology, aviation psychology, neuropsychology, traffic psychology, and performance-oriented aptitude diagnostics. From the beginning, attention has always been a basic term in scientific psychology. However, until today psychologists have not succeeded completely in separating the various aspects and findings related to attention and integrate them into an established theory at a time. According to a minimum definition, attention is a selection process: perception and imagination are focused and aimed at a part of the stimuli confronting a person simultaneously. The aspect continuous emphasizes that sustaining one's attention becomes more demanding when the task is repeated. Unlike vigilance, continuous attention is defined as selective awareness of stimuli that are either presented always or most of the time. Vigilance, on the other hand, requires a person to react to randomly presented stimuli just a few times over a longer period of time. For the measurement of continuous attention, the main aspects that are assessed refer to a general ability or willingness to perform well. These aspects are largely independent of intelligence. Rows of triangles are shown on the screen pointing either up or down. 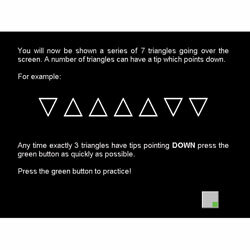 Whenever a pre-defined number of triangles points down, the respondent is required to press the reaction button. Forms S1 and S2 should only be applied to respondents who are expected to have an impaired attention capacity. The following variables are calculated: Sum correct, Mean time correct, Sum incorrect, and Mean time incorrect. Depending on the test form and the comparison sample, coefficients for Cronbach's Alpha and split-half reliability were found to range between r=.64 and r=.99. Criterion validity is given. Sustained attention is a psycho-logical construct which refers in general terms to a prerequisite of performance that is relatively independent of intelligence and effective over relatively long periods of time. The possibility that the Sustained Attention Test requires the use of higher cognitive functions can be ruled out. The test reveals the stability of a person's long-term attentional performance as an underlying requirement of cognitive abilities under speed conditions. Norms of between N=297 and N=568 normal individuals are available for all test forms; in some cases the norms are also partitioned according to age and educational level. For Form S1 a norm sample of N=369 neurological patients is also available. Between 20 and 35 minutes (including instruction and practice phase), depending on test form.